Finger-pricking for glucose readings may be a thing of the past with a new smartphone add-on device from Northeastern University in Boston. Researchers there have created nanosensors--injected like a tattoo just under the skin--that fluoresce under a special light source, indicating the patient's glucose levels, according to a report in MIT's Technology Review. The developers also created an iPhone attachment that provides three-way LED lighting under which the nanosensors fluoresce, and takes an image of the fluorescence. That image is transmitted to a computer program for analysis, the Review explains. More fluorescence indicates the patient has more of the target compound in his or her bloodstream. 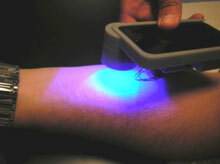 Researchers now are working an app to enable the reader device itself to analyze the level of fluorescence, so that clinicians could make determinations at the bedside, rather than having to export the information to another computer, Heather Clark, team leader for the project, tells the Review. They're also tweaking the energy source, hoping to get rid of the device's existing nine-volt battery, and possibly even tap the smartphone's own power to run it. The nanosensors also track sodium levels in the blood, which researchers say would be valuable in diagnosing dehydration in the field. Tracking iron levels in the blood for anemic patients. Monitoring medication levels as a way to titrate dosing. Measuring blood gases for respiratory and/or cardiac patients. Reviewers at iMedicalApps.com added another key use--monitoring an inpatient's status. "If you're able to track a patient's basic metabolic panel, especially their sodium, potassium, and creatinine, you would be able to avoid multiple blood draws that happen throughout the day during a hospital stay," Iltifat Husain writes.